Please join us as BookThug authors John Francis Hughes and George Bowering read from their recent non-fiction collections Nobody Rides for Free: a Drifter in the Americas and The Diamond Alphabet: Baseball in Shorts. Former bike courier John Francis Hughes chronicles his rambles through Latin America on a bicycle and former Poet Laureate of Canada George Bowering delights with his humourous essays on baseball. George Bowering reads from My Darling Nellie Gray. Jean Baird; George Bowering, The 2008 Griffin Poetry Prize Anthology: A Selection of the Shortlist. 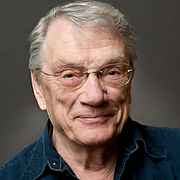 George Bowering is currently considered a "single author." If one or more works are by a distinct, homonymous authors, go ahead and split the author. George Bowering is composed of 2 names. You can examine and separate out names.